This is an exceedingly bizarre Barbie title and I think you know that that’s saying something. You see, Barbie Magic Genie Bottle actually requires a peripheral that was packaged with the game. Much like the Steel Battalion series for the Xbox which featured its own custom controller, this game is not very useful without its special attachment. 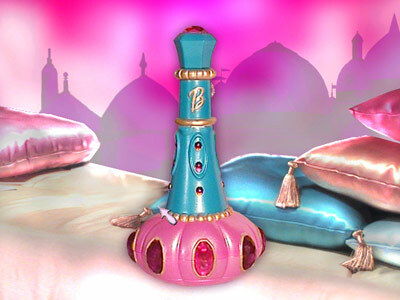 The Magic Genie Bottle is a curious artifact that is surprisingly easy and relatively cheap to procure via eBay. Not that I have tried. Until tonight, I wasn’t sure if it was strictly necessary for playing the game. Further, you would be hard-pressed to find a modern computer that is equipped to use the device. The Magic Genie Bottle interfaces via the classic-style 15-pin PC joystick port. So I fired up the game, hoping for the best, where “best” in this narrow case translates to “playable without offbeat peripheral”. The first screen is the one shown above and instructs me to wave my hand around the bottle. The game asks if I can see an animation (to be triggered on-screen, I presume), and has yes or no buttons to click. I thought I was sunk until I realized I could easily lie to the naive machine. So I got to the start of the game, where the player is walking into an antique shop holding the bottle. The storekeep asks if you know the secret of magic bottles, implying that all bottles are magic. She encourages me to rub said bottle. Uh-oh. Looks like I’m sunk. As I was scribbling notes about how much this game disappointed me, Barbie-Genie pops out of the bottle anyway, advancing the setup. We are then transported back in time to wherever it is that genie stories take place. The thrust of the game is that Barbie is a genie who had her powers stolen by some evil genie in the employ of a rotten sultan. You are to assist her in getting her powers back. This involves visiting 5 lands and procuring 5 gems. Each gem requires solving a puzzle and to solve a puzzle, you must find 5 puzzle pieces scattered about the land. Fine. At least this game exhibits a slightly more competent 3D engine than seen in the maze portion of Barbie as Rapunzel, which was developed sometime after this game, by a different house. 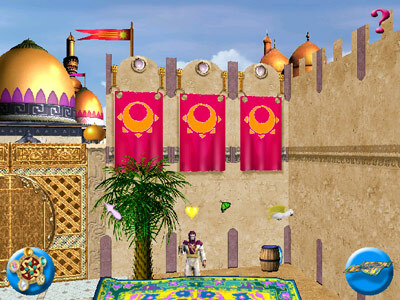 You can walk around and mount your trusty flying carpet to fly on a slightly higher plane as shown above. Barbie-Genie is always in tow, squealing instructions in your general direction. Indeed, she can get a little too close. 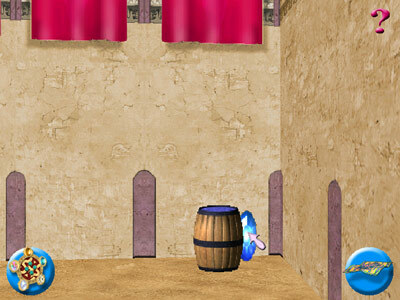 Clicking on it only earned an explanation from Barbie-Genie that the player needs to rub the magic genie bottle in order to get heavy objects to levitate. Game over. At least until such time that I can perhaps figure out how to dupe the input logic. I know a bit about how those old PC joysticks operated and they don’t have a lot of bandwidth for a complicated protocol. A project for a day long from now. I have plenty of data for a MobyGames entry.